The Douglas Shire covers an area of 2,445km² from north of Ellis Beach in the south to the Bloomfield River in the north. The economy of the shire depends mainly on tourism, with 1.2 million visitors annually exploring our many natural wonders, and agriculture of sugar cane farming and processing. Douglas is home to around 11,000 residents. Around 70% of Douglas residents live in the two main population centres of Port Douglas, the main tourist focus, and Mossman, the administrative, service, agricultural and industrial hub of the region. 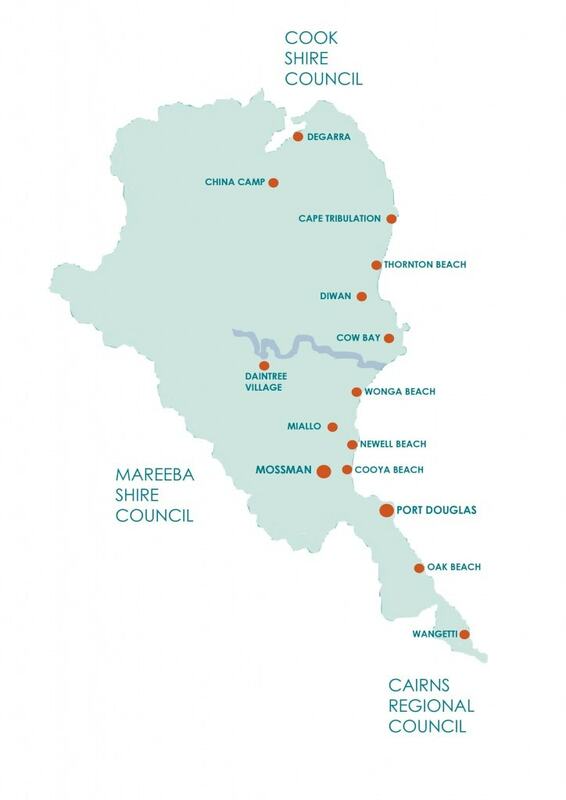 Other principal urban centres include the beachside communities of Wonga, Newell and Cooya. The remaining residents live in small, decentralised communities scattered along the 100km stretch of coast road; tucked into the rainforest or in small rural townships in the valleys of the Shire’s hinterland. Aboriginal and Torres Strait Islander people represent the largest minority cultural group in Douglas with 8.4% of the population compared to 3.6% of the overall population of Queensland. Today, 29.4% of the population of Douglas was born overseas with 9% from north-west Europe, 4.4% from Oceania and between 1 – 1.5% from each of southern and eastern Europe, south-east Asia and the Americas. Less than 1% of our population comes from each of North Africa and the Middle East, north-east Asia, south and central Asia, and sub-Saharan Africa. 6.8% of the Douglas population speaks a language other than English at home. The Douglas Shire has a slightly younger population than that of the State in general and a higher proportion of families with young children. As a result of its substantial rural and decentralised communities, the Douglas Shire has a comparatively large number of schools with small student populations. According to the most recent census figures, the region’s employment participation and number of adults with post-school qualifications is higher than the percentage for Queensland but the number of youths engaged in work or study is less than the State average. Around 35% of the Shire’s employees work in the retail, accommodation and service provision industries compared to 18% across Queensland – illustrating the depth of the Shire’s dependence on tourists.